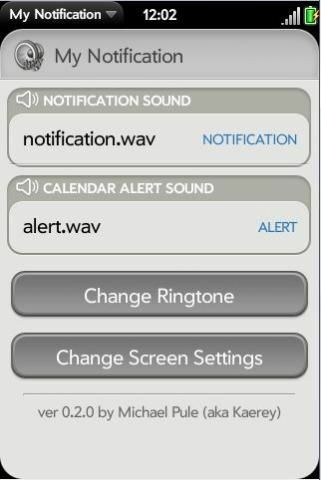 The application does the simple task of changing the sounds for notifications, calendar alerts and your ringtone. Additional functionality will be added as discovered. The complete source code is available at the #webos-internals gitorious site and we will work to update information on the wiki as well. Be Advised. When the notification is triggered, it will play the entire sound and you can not stop it short. If you pick a 20 minute Phish & DMB Jam Session for your notification sound it will play all of it! Pick something short sweet and to the point. I've included my favorite sounds below. message.wav - From Monty Python and the Search for the Holy Grail: Arrow hitting target followed by "Message for you sir"
notification - Original Palm Pre Notification Sound (before webOS 1.1 changed it) sounds. Please leave your comments for future development and we will get to it as soon as possible. Special thanks to everyone in #webos-internals. and specifically simplyflipflops, JackieRipper, and EvanDotPro for helping me get this together.